You may think that shopping a new mattress is not such a big deal. However, it can turn out to be really difficult to find the right one for your needs, especially if you are a heavier sleeper looking for a mattress capable of supporting your heavy weight with ease. So, if you are heavier than average, it will be much more challenging to find the right model that will provide you with comfort and support you need and an excellent sleeping experience. Click here to jump to our top 3 mattresses for heavier sleepers. Out of all the myriad of products that can be found online or even in brick-and-mortar stores, how can you choose the right one that will suit you if you happen to be heavier than average? Not all models that you can find in stores or online are designed to support people who are overweight. This is precisely the reason why you need to do research or consult your physician regarding the type of a mattress that would be beneficial for your size and health. The challenge doubles when both partners are obese. The obvious metrics when looking for mattresses suited for overweight individuals is one that is comfortable yet provides optimum support and that is durable enough to last for long-term use. When you are on the heavy side, you must look for these features to ensure that you’ll be getting a mattress built of highest quality materials for your money. You can’t just buy the first “good looking” model you see as your build would require more than just what is aesthetically pleasing. Putting your hard-earned money into purchasing the wrong product is a waste of time and investment. More so, this also puts your health at risk because choosing the wrong model can trigger debilitating back pain, insomnia or lack of sleep, and even further weight gain! Type – This is a major deciding factor when looking for a mattress. Latex and memory foam options are best for people who are heavier than average. Memory foam mattresses are huge favorites because they have gentle and soft layers of foam yet provide the right firmness and support that conforms to your body’s shape and doesn’t resist the pressure of your weight. Latex mattresses provide a cooling effect when you sleep which is very relaxing especially if you sweat a lot due to excess body weight. Latex is made of a breathable material which is very comfortable and provides just the right amount of bounce. Hybrid and Innerspring mattresses are also a good choice for heavier sleepers as they support heavier weight and provide excellent comfort as well. Thickness – The higher the level of thickness, the better the mattress is for a heavier sleeper. The right model should be thick enough to withstand the pressure and weight of a heavier sleeper without causing you to “bottom out”. Level Of Firmness – Medium to high level of firmness is appropriate for people who are heavier, so that you can avoid compressing the top comfort layer and resting on the harder and not so comfortable support and base layers beneath. Compression Support – If you happen to be heavier than average, you need a model that can support your weight and prevent you from compressing the mattress and sinking all the way down through it to the very foundation of your bed. Breathable – Heavier individuals usually sleep hot, so choosing a mattress with good airflow or ventilation is important to ensure you get a good night’s sleep. Thicker and heavier mattresses are not always pricier or cost more than lighter ones, especially with all the options available online today. What’s important is investing in the right product for your specific needs if you are heavier than average which is also investing in your health. There are a lot of options on the market today, but shopping for the right model suited for heavier sleepers is easier if you know where to shop and what features to look for. It is best to buy models that are built specially for those who are heavier than average so that you can get what is best for your personal needs. 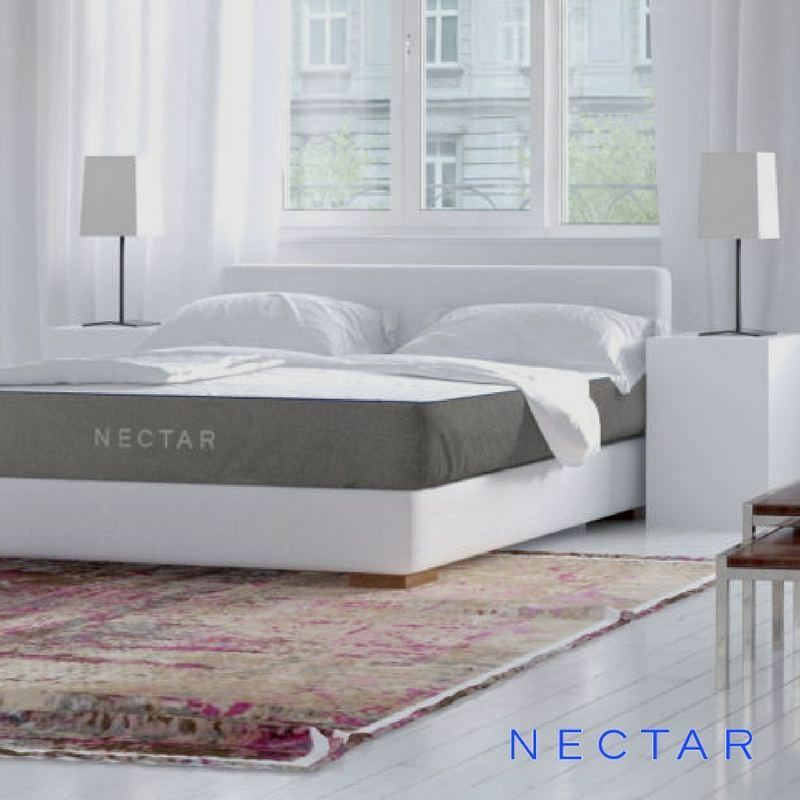 If you are a heavier sleeper and you are looking for a nice and comfortable yet supportive solution that can provide ample body support and help you sleep better with its breathable material and light bounce, then the Nectar is an excellent choice for you. The combination of memory foam and gel memory foam provides just the right amount of bounce, pressure relief, contour, and cooling that heavier sleepers need, along with a great pillow top cover that includes Tencel which is often found in mattresses costing much more. It also does a great job at distributing your weight evenly especially if you are overweight so that you won’t sink too much into the bed. It’s also a bit responsive and breathable which especially appeals to obese individuals who usually tend to sleep hot. You can get a Queen sized Nectar at only $725 by using the link above. It also has a zippered top which does not only give you the possibility to remove it for cleaning but which also enables you to add the Comfort + top kit that can provide you with a perfect amount of comfort and support necessary for heavier sleepers. It lifts your body weight and distributes it evenly across the bed without causing you to sink too much into the mattress and feeling enveloped by foam. If you want a thick bed for optimum support, the Loom & Leaf will surely fit your requirements. It provides adequate support to your head, neck, and back while also relieving pressure points. The Loom & Leaf is a combination of a 6.5-inch comfort top layer of foam and a 5.5-inch basic support layer of foam. This luxury memory foam bed offers superior quality on par with other mattresses costing much more. It is priced slightly higher than its competitors but is definitely worth the price. It is made of high-density and eco-friendly memory foam and gel foam that allows you to sleep cool and comfortable throughout the night. This prevents that sticky sweaty feeling at night and allows you a restful and continuous sleep. The Loom & Leaf also provides excellent edge support. It has very sturdy edges that are suitable for heavier sleepers with the habit of sitting on the edge. It comes in two firmness options: Medium (Relaxed Firm) and Firm (Luxury Firm) options. The Loom and Leaf is one of the best mattresses for heavy people due to the reasons above, and one of our personal favorites!